Jared Loughner: An Atheist Motivated by Nihilism? The general Arizona Tea Party climate of hostility surrounding Giffords (which unstable people are particularly prone to pick up on). His easy access to a semi-automatic weapon. All this made for an abysmal stew. If Barack Obama is assassinated in office it will, no doubt, come from an “underground man” like Loughner. 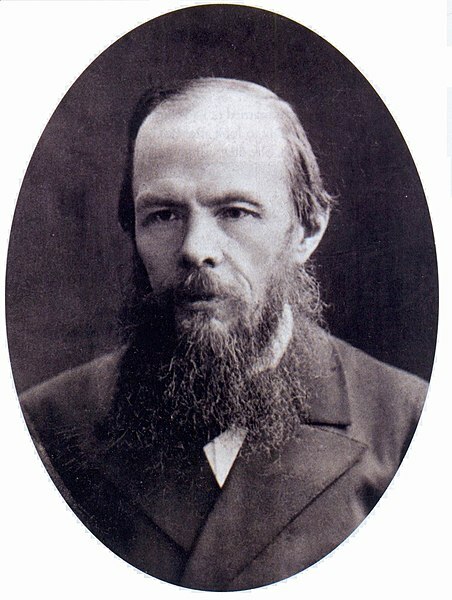 Source for Dostoevsky image: Wikipedia Commons. This entry was posted in Uncategorized and tagged America, atheism, atheist, Barack Obama, Dostoevsky, gabrielle giffords, God, jared loughner, Jesus, nihilism. Bookmark the permalink. 12 Responses to Jared Loughner: An Atheist Motivated by Nihilism? Wow. As someone fascinated by nihilism this is amazing reading. I think you’re right, that’s it’s a combination of effects. Thankyou. And, is it madness, or just a logical response to beliefs around nihilism? Is he, in fact, sane? With a very world-denying worldview, for sure, but within those bounds, sane? Neither atheism or nihilism can, in themselves, produce any motivation to kill. They are both negative descriptors of belief. Atheism: a person who doesn’t affirm the proposition, “god exists”. Nihilism (existential): intrinsic meaning does not exist / all meaning is created by the individual. Being an atheist or a nihilist doesn’t tell us what he does affirm. Since beliefs cause actions, in order to know the cause of an action one would have to know what beliefs he holds of a motivational variety. It would be extremely reckless and possibly unnecessarily prejudicial (or dangerous? given the tendency for people to demonise opposing and easily labelled sub-groups) to suggest that “atheist nihilism” is to blame. Nihilism (moral skepticism): nothing is morally wrong. 1) What does Loughner believe affirmatively? 2) How does Loughner find meaning? 3) What are Loughner’s goals? 4) How do other people relate to Loughner’s goals? I know that people often appreciate locating a pattern in any trauma or chaos but it would be a shame to jump to indelicate conclusions simply to find an answer that “fits” (at least stereotypically speaking). I’m not sure I agree that “non-beliefs” equates to “non-actions” or “non-motivations”. I guess people who hold a philosophy don’t always act completely rationally within that philosophy. I know when I’ve been tempted to nihilism, there came a sense of both freedom to do whatever I wanted, and also a desire to destroy, to make others realise what I had realised by resorting to violence. These were just ideas in my head, I never carrried them out. My point is, once in the grip of a worldview like Nihilism, one could carry out actions that might not be “reasonable”, but were emotionally engaging to a disparing soul. Great, an atheist nut job. That is sure to help cast us in a great light. If we check, we’ll probably find that Loughner played first person shooter video games and watched movies where people were killed with swords. He may also have heard Obama’s remark about using guns if opponents use knives. Maybe he read about all the violence by druggies in Mexico or the kidnappings and murders in Phoenix by drug cartels. More crime equals more chaos. Maybe Loughner read about killings by Border Patrol agents or about the wars in Afghanistan and Iraq. Like much of the despicable media, Santi bases his accusations on his fantasies about the Tea Party causing “unstable” people to kill and has no evidence of linkage to back his speculations. Perhaps evolutionary theory did it, since it can easily lead to nihilism (Columbine and the Finnish nut); perhaps immature minds can’t handle it. Being free requires the risk of being a victim of nuts like Loughner.